Here is a showdown between TsubasaP and Die-ToryoP! 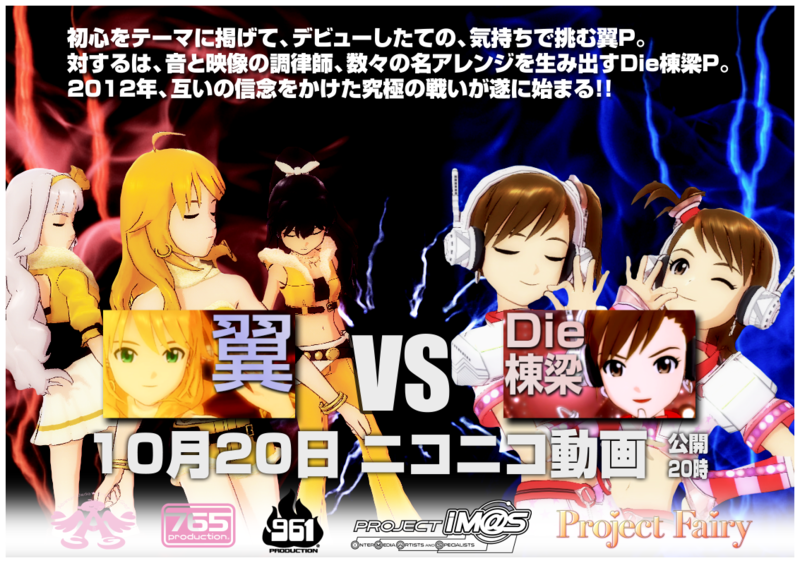 They determine the winner of this competition with the placing in "The iDOLM@STER Weekly Ranking", and there is a cool publicity poster. Die-ToryoP rivaled TsubasaP with this movie. There is little difference in their views and mylists. Which do you prefer, TsubasaP's video or Die-ToryoP's? Today's last pickup is aaa's stylish work. He/She packed so many things into this one-minute movie that we are surprised at the length of one minute. You know, with that candy background, someone should have those gals dancing to some AKB48 song, say "SUGAR RUSH"? So, how's that for an idea, dude? I guess you saw the new music video of AKB48. Your idea sounds good. If we find the combination, we will pick it up.